SYSTRA is project manager of Paris Metro line 12 extension. From 2019, two new stations will come into service. Mairie d’Aubervilliers and Aimé Césaire: here are the names of the two new stations that will be created with this project, won by SYSTRA in 2010. Line 12 extension, whose commissioning is planned for 2019, will take 20 minutes to go from Saint-Lazare station to Mairie d’Aubervilliers in the North. By connecting with the Line 15 of the Grand Paris Express, the extension will promote activities and exchanges between Paris and the inner suburbs. 52,000 travellers per day are expected. Project manager Franck Coulaud explains: "We are carrying out this work in the town centre of Aubervilliers. The nearby St Denis canal is being used to deliver aggregate for the concrete, and spoil from excavation is shipped out along the river, cutting lorry traffic. This cuts out between 45 and 50,000 round trips by lorries during the project". The geological context (water, gypsum, Beauchamp sand) poses a number of difficulties for this work, particularly joining the tunnel to the station Mairie d’Aubervilliers. This unique station is 280 metres long and includes a light maintenance centre for trains. Moreover, these future underground structures are situated in a densely built-up area, along a major trunk road, surrounded by a lot of buried networks. SYSTRA’s teams proposed technical solutions to cope with the challenges raised by this project. For a start, the choice of a diaphragm retaining wall for the stations, to guarantee uninterrupted pedestrian and road traffic. 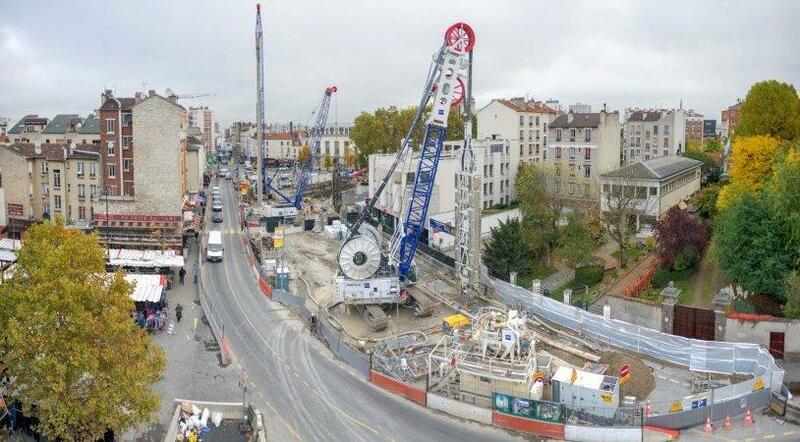 SYSTRA completed the 33.000 m² of diaphragm wall for the future “Mairie d’Aubervilliers” station, with 1m to 1,20m thickness, from 40m to 45m depth. To improve the soil, a deep-freezing is done for the liaison tunnel/station. The soft ground, as well as the water table which is only a few meters below street level, have strengthened team in choosing this solution.